Open to students and friends of the seminary. Applications close as of 31 March 2010. Space is still available but limited. Please contact Madison Grace for more details: oxford@swbts.edu or 817-923-1921, ext. 4495. 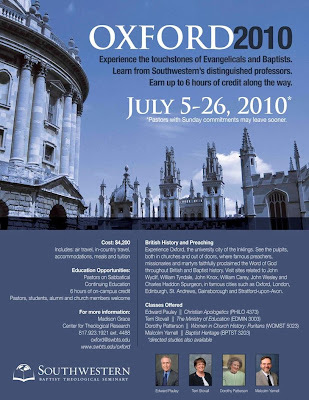 See also www.swbts.edu/oxford.